Only at night, code becomes poetry. Computer science is a field in which you often enough get nervous about about picking up a five year old book because it might be already outdated. 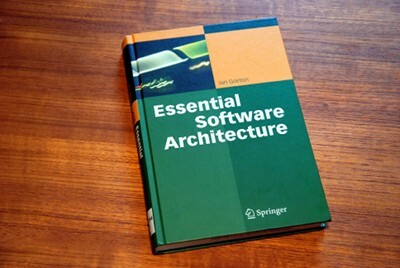 Well, either I am behind on the topic or Ian Gorton‘s work is aging pretty well so far; a nice to-the-point cover-to-cover read that might not teach you a world of new technologies, but certainly helps with sorting the ideas about software architectures and architects you might have floating around in your head. In addition to that, it puts concepts such as Web Service, SOAs, MDAs, and Semantic Web nicely into perspective without being afraid to point out where they can’t hold up to marketing promises. I will be looking into getting a copy for my bookshelf. It appears that a 2011 2nd edition has been published in May. This entry was posted in Books, Software and tagged Documentation, Large Scale Systems, MDA, Middleware, Semantic Web, SOA, Software Architectures by Timo. Bookmark the permalink.